Written by Miriam L. Campanella. The People’s Bank of China made headlines in 2016 for selling massive chunks of its foreign exchange reserves to shield the renminbi from greater depreciation on the back of accelerating capital outflows. By selling dollars from its over 3 trillion reserves to ease tensions on the currency, foreign exchange reserves fell below $3tn for the first time in five years in January 2017. Yet, the fall of foreign exchange reserves is a trend, and not just a China’s job. The US Treasury International Capital data for the month of September 2016 corroborate the trend of a steady unloading of US T-bonds. In 12 months there was a massive $343 billion in Treasury selling by foreign central banks in the period July 2015- August 2016, something unprecedented size. Offshore central bank sales in the LTM period ending August 31 have – one month later – levitated to a new all-time high $374.7 billion, or well over a third of a trillion in Treasuries sold in the past 12 months. In view of the Trump Administration’ pledge of one trillion dollars in infrastructure investments, and a massively tax cut, the costs on the Federal Government debt is set naturally going up. How should the Fed behave? Will it engineer an up-the-ante, fresh quantitative easing, with consequences on its inflation credibility, or will it retrench, to defend its anti-inflationary credibility? If the easing way were to continue, taking the risk of continuing to overburden monetary policy with quantitative easing, and low interest rate, this behavior will spread uncertainty and systemically significant disturbances, that will induce Emerging Market (EM) central banks, major buyers of dollar and euro debt assets, to accelerate the shift to more independent and discretionary prudential policies, and more active use of FX reserves assets, with the consequence of dumping the US dollar and euro’s denominated foreign exchange reserves. A primarily indication in this direction is gold purchases. Recently, Kenneth Rogoff has made a strong rationale for EMs central banks of purchasing gold and exiting from an overweight dollars’ FX reserves. EMEs as a group, Rogoff writes, “are competing for rich-country bonds, which is helping to drive down the interest rate they receive. With interest rates stuck near zero, rich-country bond prices cannot drop much more than they already have, while the supply of advanced-country debt is limited by tax capacity and risk tolerance”, so “a shift in emerging markets toward accumulating gold would [push up interest rate on rich-country bond and] help the international financial system function more smoothly and benefit everyone”. Actually, EMs central banks for securing FX reserves since they have massive dollar debts and want to reduce their dependence on the US dollar are going to gold purchases. China and Russia over the past two years accounted for nearly 85% of gold purchases by central banks in a move to diversify reserves, whilst demand from other central banks has declined. Russia’s gold reserves increased by 45.8 tons in the first quarter 2016. That was 52% higher than the first quarter 2015. China bought 35.1 tons of gold from January to March of 2016. That was in addition to the 103.9 tons it purchased in the second half of 2016. During the past 15 months, China has increased its gold reserves by 70% to 1,700 tons. That puts it in sixth place for the country with the world’s largest gold reserves. From 2009 to 2015, China was buying 6-8 tons of gold per month. But in the summer of 2015, it doubled its appetite for the precious metal. Russia’s gold reserves have increased 21% to 1,460 tons. The country started buying gold in 2015, increasing purchases on the back of falling oil prices. Russia – the world’s fourth largest gold producer after China, Japan and the US – is indeed set to become a major supplier of gold to China, the probability of a scenario hinted by many over the years, namely that Beijing is preparing to eventually unroll a gold-backed currency, increases by orders of magnitude. 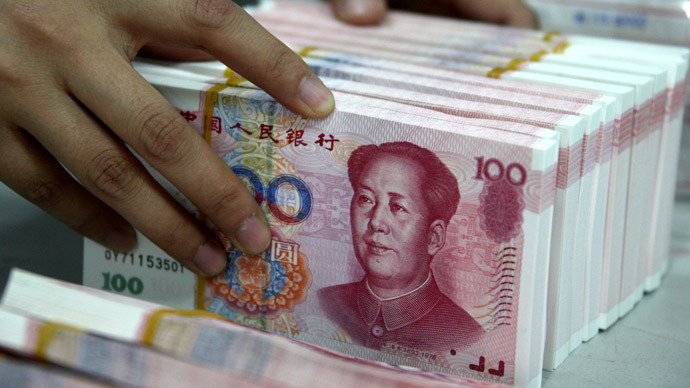 China’s U.S. Treasury holdings have remained relatively flat, at around US$1.2 trillion, since 2010, according to Treasury International Capital estimates. The People Bank of China (PBoC) claims to have held 1,054 tons of gold since 2009, though it may have three times that amount; estimates varied wildly. It’s an open secret that the PBOC buys gold in the over-the-counter market. Countries along the New Silk Road are originating a new way to use their savings, and that is a game changer with relevant implications on the U.S. Treasury bonds and developed governments’ sovereign market. The gold trend, though, has downsides, at least for the US dollar dominance. In 2014, at the height of China’s FX build up, Alan Greenspan pointed to a redeployment of “even a relatively modest part of China’s foreign exchange reserves into gold, the Chinese yuan could take on unexpected strength in today’s international currency system. 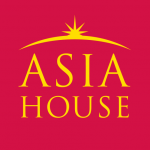 Buying gold bullion to displace the U.S. from its position as the world’s largest holder of monetary gold, China would likely incur a penalty for being wrong, in terms of lost interest and the cost of storage. Yet it would be a modest cost, if in the end this clears the way to a multiple and more balanced international monetary regime, less at the mercy of U.S. domestic objectives”. Yet, a more transformative trend could develop from a global downsizing of the FX reserves pile up, and portfolio reshuffling. According to Winkler et Alii of the Deutsche Bank, the peak reached in 2015, ensuing two decades of relentless growth, is going to end. Emerging markets’ central banks are set to stabilize but more likely to continue to reduce FX purchasing. Since 2015, this trend is propped up by three cyclical drivers owing to structural changes, which have permanently reduced the need for reserves as well. In China, external pressures to let the yuan free-floating are leading to a new foreign exchange reserves’ policy, which implies less interventions, and consequently a sharp reduction of FX reserves holdings, especially in US dollar. In GCC (Gulf Cooperation Council), the collapse of oil price, unlikely to return to previous highs, and the policy of US energy independence reduce petrodollar recycling. In 2016, Saudi Arabia and Qatar raised $33bn on global debt markets, 10 times the amount borrowed the previous year. In Pacific Alliance Nations – including Chile, Colombia, Mexico, Peru- and Brazil, exchange rates have weakened, and net private inflows have reduced. With ample international reserves at their disposal, several central banks have resumed or stepped up FX intervention with the aim of mitigating exchange rate volatility, and to expediting the economy’s de-dollarization (Institute of International Finance, 2015 ). There are implications of these cyclical trends showing on the rising pressure on global fixed income yields and especially on the US T-bonds. The metrics of these movements emerge calculating the reduction on the German Bund and the US Treasury Bonds’ yields by the EM central banks’ purchasing. Building up 10 trillion US dollar foreign exchange reserves since the start of the century, central banks in emerging economies have reduced Bund and US Treasury Bonds’ yields by more than 100 basis points. 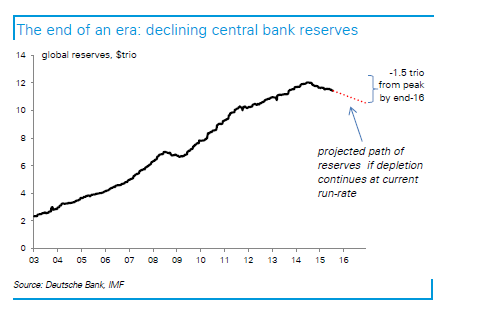 Consequently, in the reverse cycle, FX reserves’ shift will cumulate a comparable tightening, which will “present additional headwinds towards developed market central banks’ exit from unconventional policy in coming years” . For now, those sales have had a small, but visible impact on America’s funding costs. Selling by foreign central banks since March 2015 has added 0.3 percentage point to yields on 10-year Treasuries, which ended at 2.05 percent in 2016. An additional push to EM central banks’ withdrawing foreign exchange reserves from the usual US-T bonds is likely to come from a full market valued yuan. With the Chinese currency turning more volatile, China’s trade partners, especially those in emerging economies, should plan FX reserves reallocation in yuan rather than US dollar. For the “thick economic networks of Asia economies, and the role of China, [EM] central banks in order to smooth out exchange rate volatility vis-à-vis the Chinese yuan need to hold yuan’s rather than US dollars”. In the end, the liberalization of the yuan and higher volatility, are factors of acceleration in the shift in reserves portfolios. EM central banks, and more likely advanced central banks, will need to redeploy larger chunks of foreign exchange reserves into the China’s currency, with a further depreciation of the US-T bonds. Miriam L. Campanella is Senior Fellow at ECIPE and the Jean Monnet Professor at the University of Turin. Image credit: CC by Wikipedia Commons.